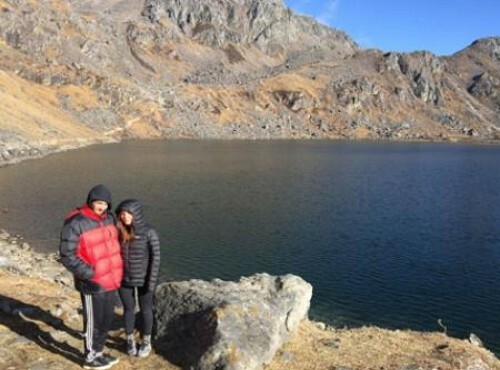 Helambu Trek is a lower altitude trek in the Langtang region. It is the nearest trekking to the Kathmandu valley. It is straightly linked with the local communities, who are the indigenous groups of Nepal. Sherpa, Tamang and other groups populate this region. Trekkers can explore the local villages and their traditions, including garments, foods, and drinks. Himalayas, green hills and other natural speculates further allure you to enjoy the god gifted ecstasy. Trek to Helambu valley begins from Sundarijal, after a short drive west of Kathmandu. It is a watershed area, which has become a place of attraction for the urban people. The trekking trail is comprehensive and easy. Passing wonderful Mulkharka, you reach to Chisapani, which is the first camp and a better place to stay. Crossing the green hills and gorge, you arrive at Kutumsang and Tharepati pass. Tharepati is a tough walk, which has got a hat falling steep ascending trail. The sceneries of Dorje Lhakpa and the Langtang panoramas are seen fabulous. Helambu valley is named from the Hyolmo community, who is the indigenous group of Nepal. Sherpa people of this valley are entirely different than of the Khumbu valley. From Tharepati pass, you walk to Tarkeghyang, Sermathang and to conclude in Melamchi Pul Bazaar. SermaTang is a Sherpa village where we can explore the beautiful monastery with the beautiful Jugal Himal in the north face of the village. This short and exciting Helambu valley trekking is an ideal trek, which is suitable for the seniors and children equally. Adventure Club Trek manages all the required paper works and Langtang National Park entry permit and leads you to this culturally significant valley located in the lower Langtang region. Please, contact us for more details. Day 04: Trek Chisapani to Kutumsang. Day 05: Trek Kutumsang to Tharepati. Day 06: Trek Tharepati to Tarkeghyang. Day 07: Trek Tarkeghyang to Sermathang. Upon your arrival at Tribhuvan International Airport (KTM), you will be welcomed by a representative from Adventure Club Trek. After sorting out your custom formalities (visa and so on), you will be then transferred to your respective hotel in Adventure Club Trek’s private vehicle and give you some time to freshen up. After this, you will attend an orientation about your trek led by the trekking leader over a welcome dinner..Overnight at hotel. The exciting day begins with a cultural tour to various mediaeval sites in Kathmandu. You will drive to visit the UNESCO listed world heritage sites - Pashupatinath Temple (the biggest Hindu shrine), Boudhanath (largest Buddhist Stupa in Nepal), Swayambhunath (a fine Buddhist stupa at the hill top of Kathmandu) and the Kathmandu Durbar Square (an open museum and abode of Kumari). Coming back from the sightseeing, you will take part in a short briefing and trip preparation .Overnight at hotel. After breakfast, we drive to Sundarijal, which takes about an hour. Then we begin to trek to Chisapani. The cascading waterfalls entice us extremely. We can see the large fountains everywhere. Then we ascend through the steps and get entry permit of the Shivapuri National Park. First we reach to Mulkharka and then Chisapani. It is a beautiful village populated by the Tamang people. Overnight at lodge. The second day of trek, we start the trek to Kutumsang from Chisapani. First we descend to the fields after walking over the meadows. Then we climb up and reach to Pathi Bhanjyang and Gul Bhanjyang. The striking views of the Langtang range are mind blowing. Then we trek further to another pass and descend to Kutumsang. Overnight at lodge. Beginning the trek from Kutumsang, Mostly we walk through the steep up trail dotted by the fir and rhododendron forests. There, we do not find human settlements. Climbing to the Yurin Hill, the glorious Himalayan panoramas can be explored. Climbing up continuously, we reach to Tharepani and rest. Overnight at lodge. After breakfast, we begin our trek to Tarkeghyang. We walk down to the Melamchi Khola and cross it. On the way, we pass some tiny Sherpa villages. Some of the Tibetan peaks shine on the horizon. The monasteries and Chhortens display the cultural adornments are breathtaking. Sherpa people are not only innocent, but also extremely hospitable. Walking further, we reach to Tarkeghyang and rest. Overnight at lodge. The trail from Tarke Ghyang to Sermathang is relatively easy. The trail is flat and even the route through the forest is gentle. Semathang is a Sherpa village where we can explore the beautiful monastery with the beautiful Jugal Himal at the north face of the village. Overnight at lodge. The last day of the trek, we trek down from Sermathang to Melamchi Pul Bazaar. Sometimes we walk through the meadows and forest and also through the farming land. We pass several ethnic villages that are ancient and unique. Then we walk through the bumpy and graveled path up to Lamidanda and through the fine trail to Melamchi Pul bazaar. Then we drive further to Kathmandu and transfer you to the hotel. Getting refreshed, you will be invited for the farewell dinner in a typical Nepali restaurant hosted by Adventure Club Overnight at hotel. All necessary paper work and permits (National park permit, TIMS). My trek with Adventure Club Trek was based on my hiking experience and my interests that Birenda took into consideration, and so I went on a brief trek through the Chichipani, Chipping, Terkeghang with Chabi who was the sweetest guide I could have ever wished for, he was very knowledgeable and friendly and made my trekking experience so awesome, with a balance of allowing me to soak up the atmosphere privately in the high peaks overlooking serene landscapes, and being great company throughout the rest of the hike, providing motivation, humor and facts about the area. The trek itself was so great, and felt like an awesome start to a hobby I can take up now in my home country. My trek was a beginners level, that pushed me to my physical limits at times, but with Chabis motivation and breaks in between climbs, I was able to climb to heights that suprised me. It was such a rewarding experience. Although it was at a beginners level, it wasn't "easy" it was quite tough at times, proved to be a challenge but not impossible or excessively difficult to accomplish, and it wasn't lacking in beautiful views or dramatic scenery. At times I felt like Indiana Jones, or Lara Croft.. some kind of explorer. I even had at a time climbed over a large precipice type rockformation on a mountain that had ferns and large boulders and made me think of like.. the land before time, or some kind of Dinosaur setting. Like I was looking over land that was so natural and separated from mankind (Don't worry, there were teahouses dotted along my particular trek. I wasn't lost from civilisation. Though at times, the views of the landscape were so dramatic and beautiful in inspired me to feel that way) So many beautiful views, and it felt like each day I got a different concept of Nepals beautiful landscape - the first day it was all mountainous, hiking at first through a national park, and then through farmland that went up the mountain before having lunch at the top, and then heading along the mountain top and going down to our accomodation for the night. The second day, we headed up a second mountain, this time again it was mountainous with the occasional farmland, before we reached the top, headed across the top witnessing spectacular views. That night we stayed high up with a great view from atop rice paddie fields. The following day we headed down through the rice paddie fields and the abundant cultivated land, down the mountain till we got to a large river, which we walked the side of for the rest of the day, seeing wild lavender at the side of the trail, and fields of bright yellow canola, contrasted with the bright blue sky, pure gleam of the blue river and the bright white rocks and boulders that made the river bed. It was spectacular. I felt like I honestly was walking through the scene of some kind of famous European painting. I honestly couldn't thank Birenda, Chabi and Adventure Club Treks enough. I was lucky that I had the opportunity to be able to travel to Nepal in the first place, but I felt truly blessed that I was able to experience the Trek of a lifetime. It inspired me in so many different ways. The imagery will always be ingrained in my mind. Birendra did a wonderful job of organizing a trek for me in the hills around Kathmandu. He chose a trek that matched my fitness level and that offered many beautiful sights, plus the experience of walking through and staying in the villages. The guide he arranged for me was a pleasure to spend time with. He was very knowledgeable about not just the area that we were in, but Nepalese life, culture and environment. He also knew the owners and workers of the guesthouses we stayed in and we were warmly welcomed and well fed on dal baht in the evenings. The trek was a perfect introduction to hiking in Nepal and a very welcome break from the chaos of Kathmandu. The views of the valley and the city on the third day as we walked down to Changu Narayan were splendid. I could not recommend Birendra and his company enough. Birendra has many years of experience as a guide, expedition leader and now as trekking company manager. He knew exactly what would suit me. As soon as you start to discuss your trekking options with Birendra you will see that he is competent and professional. He is also personally very engaging and fun and has a deep love for Nepal and the Nepali people and is involved with a number of local projects. He went out of his way to help me get settled and to give me a small insight into modern Nepal. Thank you Birendra for organising my hike and to Toby, my guide for being such great company. I intend to do more hiking during my time in Nepal and I wouldn't consider using any other company. Accomodation Hotel in Kathmandu and lodge, and teahouses during the trek.